4th January 2015 – Timothy Toroitich (UGA) started 2015 just as he finished 2014, by winning a cross-country race in Spain. At the 69th Cross Internacional Zornotza in Amorebieta, Toroitich took his winning streak to four races. 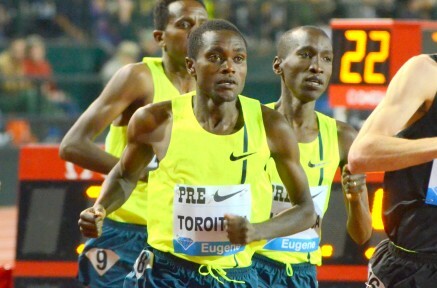 This time it was the narrowest of victories over countryman and fellow PACE athlete Moses Kipsiro (UGA). The pair pushed on over the final lap to move away from European bronze medalist Alemayehu Bezabeh of Spain and fought each other all the way to the finish with Toroitich prevailing by inches despite the official results separating them by a second. Continuing a slightly different winning streak of her own was Magdalyne Masai (KEN) who won the Amorebieta race for the third year in succession. Maggie has been training hard in Kenya and showed the fruits of her labour with a convincing victory by 11 seconds. At the opening indoor meet of the season at Lee Valley, World Junior 100m Champion Dina Asher-Smith (GBR) began her campaign in style by running 7.25secs in her 60m heat before winning the final is 7.23secs; a current equal world leading time.